Today is the last Guest Artist! 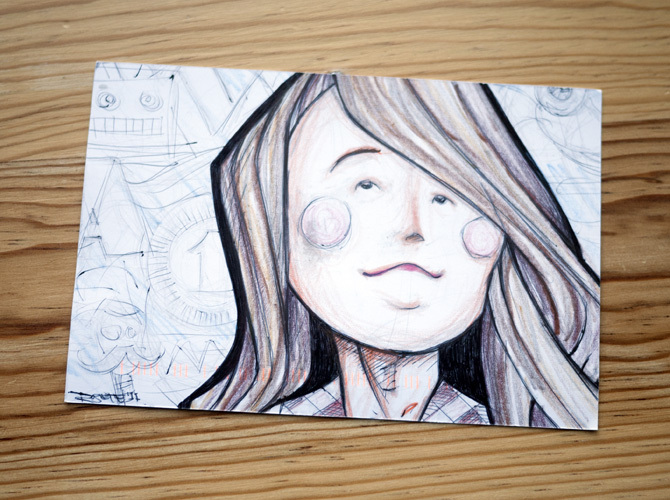 I am sad to see the Guest Artist postcards come to a close, but it ends with one of my favorites! I might have a slightly a biased opinion, but I had a big smile on my face when I got Varick Rosete’s addition to the project. Throughout the whole project everyone’s postcards have surprised me, but I think my boyfriend was the most surprised when he got the mail and found this. He called me immediately to aske if I have met Varick in person. I responded no and then was asked, “How does he know what you look like?!? !” I could only laugh and couldn’t wait to get home to see the card. It is true I haven’t met Varick. The lovely Thy Doan hooked me up with him (another AIGA connection and hopefully new friend) when I had told her about the project. I am so glad that like Thy, Varick was up for drawing a postcard. 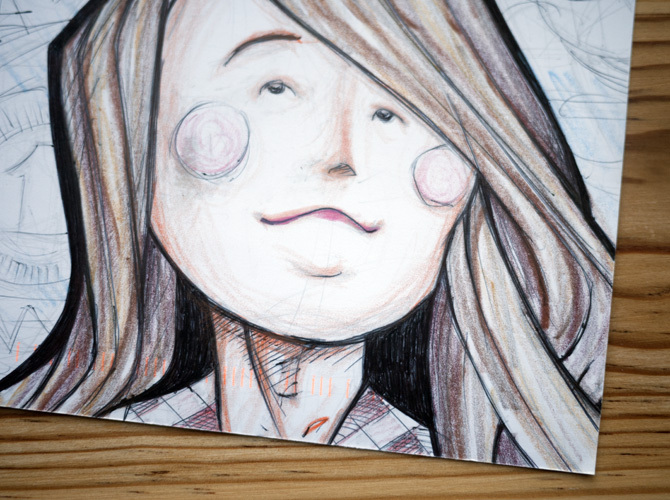 I have no confirmation that the illustration really is me, but if you check out my twitter picture and compare…. seems pretty similar to me! Thanks so much Varick and I hope to run into you next week at AIGA’s PIVOT in Phoenix, AZ. WOOHOO!! I’ve been poste-ed! Yes, to confirm, that is you from yo’ twitterer. I was originally going to draw something really weird and strange but then I thought “what do I normally draw?” I draw characters. I love people watching! I love thinking of their “-isms” and drawing them. Your character in your twitter appears to be that type to have a curious imagination that daydreams about the spectacular. Thanks again for letting me play along. I’ll see you in Phoenix!